** This review appeared in the now-defunct malaysiansider in January 2015. J.S.WONG danced in silence, his grunts and gasps of air punctuating the air, but it left a big impression on the audience. The dancer-choreographer, now the artistic director of Damansara Performing Arts Centre, performed the madness and cruelty of Roman emperor Caligula with evocative brilliance. The dance piece was inspired by Richard Nixon, the US president at the time, and premiered in 1973. To make a strong political statement in dance is unusual in Malaysia. The last attempt at that was in the playful Becoming King, by Joseph Gonzales last year. Caligula was but one of seven main pieces in Patrick Suzeau’s dance soiree at the Temple of Fine Arts in Brickfields on Jan 18. Another outstanding performer was Aswara’s Raziman Sarbini who breathed joy into the opening piece, Gandharva, with precise movements. He displayed full control over his talent and physical form in this energetic piece. 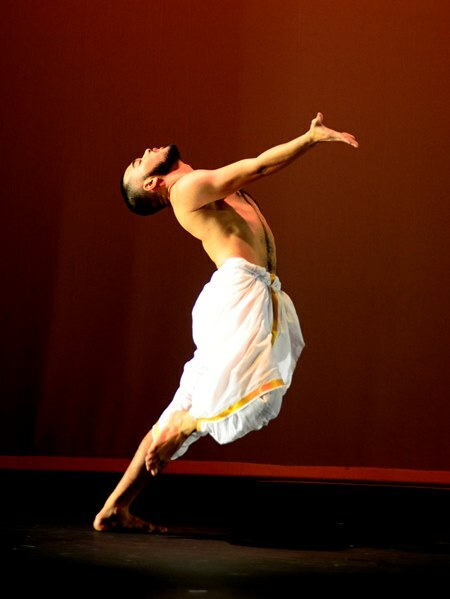 Choreographed in 2006 by Suzeau, the dance was a western contemporary twist to Indian classical dance, both bharathanatyam and odissi. Suzeau’s dance inspired by Malaysia, called Muddy Confluences — Ode and Addiction, was interesting for its pop culture references. The 15-strong troupe from Aswara (National Arts Culture and Heritage Academy) danced in unison to the drum score, while using their handphones. However, some of the dancers seemed to lack commitment to the piece. They movements seemed sluggish and some seemed even a bit lost. When taken as a whole, they threw light on those who were physically sharper and more invested in the piece. This was in sharp contrast to Suzeau’s own fun dance called, Winsome Wench And Handsome Hero Vanquish Vile Villain. A modern dance with mime, Suzeau merely used a ribbon tied in a bow to depict the wench, the hero and the villain. It was energetic, and Suzeau played all parts to good timing. For example, the punches delivered by the hero were then played out by the villain, in receiving the blows. The dance was completely enjoyable. I also enjoyed the slow Emergence, an abstract piece inspired by a 2013 residency at Rimbun Dahan. The three dancers slowly weaved a spell about the wonders of a green environment. The soiree ended with a suite of six solos set to French songs by Barbara, George Brassens and Jaques Brel. These provide the landscape for a series of poetic kinetic images woven through the text. All are sung by Barbara (born as Monique Serf), who has been acclaimed as “the voice of France”. Choreographed by Suzeau in 2012, one solo piece called This Morning was an ode to her lover. It was moving in its simplicity of movements but the strongest dancer was in the last piece. Aswara Faculty member Tan Kooi Lan also danced about love, (one line went, “I know I love you still”), but with strength in her contemporary ballet movements, and expression on her face and body. What a lovely way to end a Sunday evening. Next PostBoy George has a new single after 19 years!